When I started working with Jo last year I was competing at 1.10 level and doing ok but, more often than not, we would have a pole down for reasons I couldn’t identify. It was becoming very frustrating because I knew that we were capable of better. Jo was able to assess our strengths and weaknesses, together and as a partnership, within a very short space of time and tailored our sessions to suit our specific needs. I was able to take the exercises and invaluable advice and practice at home. I quickly began to see real improvement not just in my horse’s way of going but in my riding and my understanding of what was required for me to excel. This season we are consistently jumping clear rounds and becoming more competitive in jump offs. We are also preparing to move up a level to 1.20 – something I never imagined would be possible. Jo is very intuitive when it comes to rider psychology. 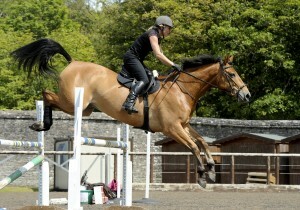 She knows how to get the best out of each individual rider and how far out of their comfort zone she can push them. As a result her lessons deftly walk the line between challenging and confidence boosting. I am enjoying riding, jumping and competing more than I ever have done and my horse just keeps getting better and better. I would emphatically recommend Jo to anyone wanting to see a real improvement regardless of level or ability. 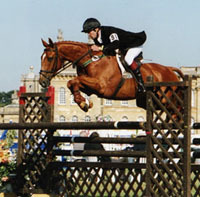 Jo Winfield coached me at Blenheim Horse Trials in 2003. She worked with me in the build up to the dressage test with Secret Papers. He is not an easy horse to prepare and her overview and perceptive comments allowed me to produce a much improved performance. I met Jo just after she had achieved her very prestigious Fellowship. Rather nervous of her at first, I discovered a person who instilled in me a positive outlook to achieve more. She is generous in sharing her knowledge and has an understanding and awareness of what makes individual riders succeed and improve. Jo has been visiting our yard for many years and teaches a number of horses and riders of different ages and experience, with very different goals. After all these years, I still come away from every lesson feeling like I’ve learnt something and that my riding has progressed. I don’t remember Jo ever telling me what I was doing wrong but instead she has always helped me to work it out for myself. I always leave a lesson feeling positive as Jo is exceptionally good at judging mood of both horse and rider and tailoring the lesson to ensure that we have challenging but achievable goals. Jo has spent many years studying psychology and physiology of both horse and rider and this makes her approach different to many other instructors. Through her holistic teaching she has helped me better understand the connection between myself and my horse, and greatly improved my riding. 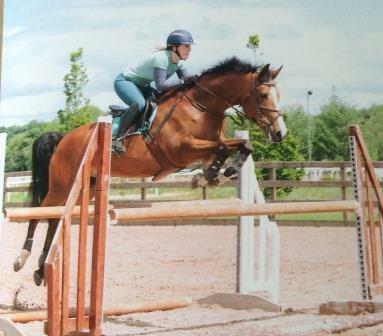 I would not hesitate to recommend Jo to anyone wanting to improve their riding, solve a problem they are experiencing with their horse or interested in trying a new approach. You will find her lessons to be fun but challenging, and you will always feel like you’ve made progress.